Today I am talking about book covers. A book cover doesn’t necessarily say whether or not I am going to read a book, but if a book has a beautiful cover I am more likely to delve into it quicker. Here are some of my favorite. Linking up with The Broke and the Bookish. Insurgent by Veronica Roth- My favorite part of this cover is the train in the bottom part of it. It just fits the story. On a side note, have you seen the cover for Allegiant? LOVE! Crossed by Ally Condie- I love the image of breaking out of the bubble, breaking out of the shell. Perfect for this second book in the Matched trilogy. Everneath by Brodi Ashton- The swirling ground and flowing dress. It matches so much of what I had pictured in my head for this book. Girl of Fire and Thorns by Rae Carson- I find this cover mesmerizing, just like the book. Scarlet by Marissa Meyer- This cover is fun and so interested. Perfect for a Red Riding Hood retelling. Speak by Laurie Halse Anderson- This cover is haunting and captivating. Clockwork Princess by Cassandra Clare- This book was one of my most anticipated releases of the year and every time I saw the cover I was even more excited to read the book. The Unbecoming of Mara Dyer– I love the story this cover tells. It might be one of my favorite covers of all time. It is so telling of the story, love and drowning in the world. The Night Circus by Erin Morgenstern- Another one of my favorite covers. I love the small details. I have to agree with you on covers – a beautiful cover will usually get me to read the book before I may read books that the covers aren't that great. I just love all of the covers of the books you have pictured – great choices! I have the Unbecoming on my list, too. 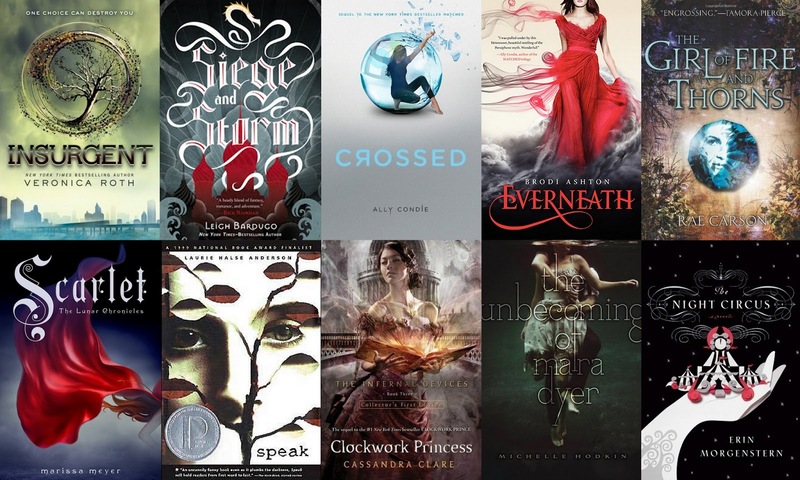 I love the covers of Clockwork Princess and Siege and Storm, but haven't read them. Great list! oh hey we're twinsies on a lot of these! I've always loved that saying, 'don't judge a book by it's cover', but I totally do! Usually if the cover catches my eye I will read the description. I loved the book Insurgent, and I just bought Scarlet 😀 I will have to check out those other books! I've been looking for a good book, and I LOVE several of these covers. Thanks for sharing!